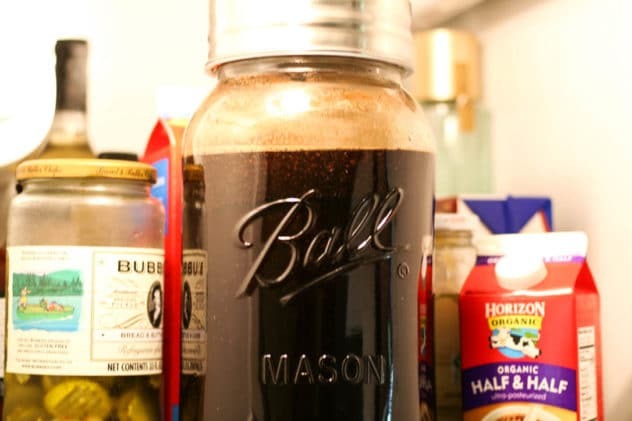 Cold brew coffee with homemade vanilla creamer is THE perfect summertime coffee drink! Of course, this recipe includes a homemade dairy free vanilla creamer – as with all of our dairy free coffee creamer recipes. Cold brew coffee is not the same as coffee that is brewed hot and then sets and gets cold. 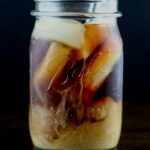 Nope, cold brew coffee has its own brewing process and this recipe will walk you through the differences between cold and hot brewed coffee as well as how to make your own batch of cold brewed coffee. I prefer my hot coffee black, but for some reason, I really like a good, creamy cold brew coffee. 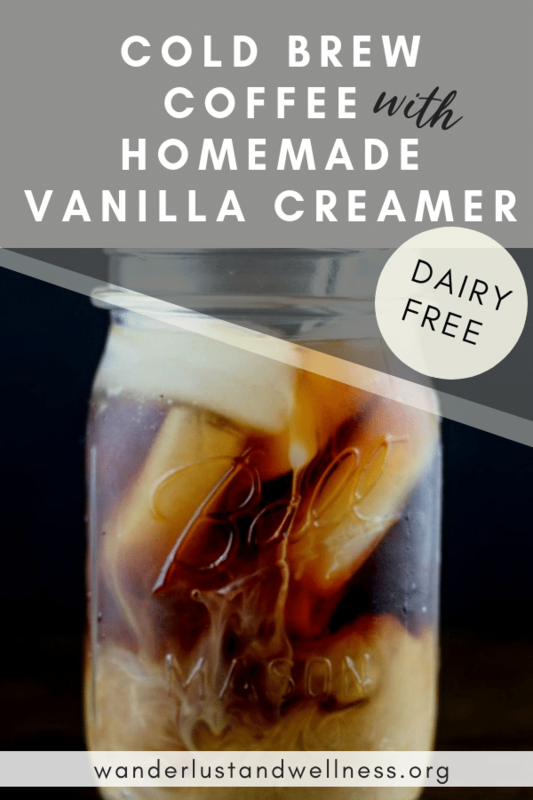 I wanted to create a dairy free creamer to go along with my cold brew coffee and this homemade vanilla creamer did the trick! It is super simple and you can store it away in a mason jar to use throughout the week. 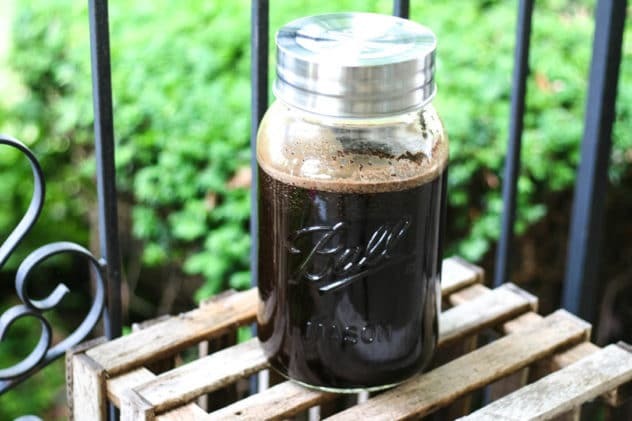 The result….the best homemade cold brew coffee I’ve encountered. Add in as much creamer as you’d like, it won’t disappoint. This is the perfect summer drink, when you want that strong coffee flavor but maybe don’t want to guzzle down hot coffee on a hot summer day. In a nutshell, cold brew coffee is made by letting the coffee grounds sit in water for 12-18 hours. The typical ratio is 3:1 (cups of water:cups of coffee grounds). The result is coffee that is less acidic, and more flavorful. Cold brew uses time rather than heat to extract the flavors and caffeine of the coffee. What is the difference between cold and hot brewed coffee? Less acidic – Heating releases acidic oils from the coffee bean, which results in a higher level of acid levels in hot brewed coffee. Cold brew coffee, because it does not go through the heating process, is less acidic and more alkaline. Our bodies tend to function best when it’s in a more alkaline state. Less acid is also good for those individuals who may suffer from acid reflux or other digestive issues that coffee tends to trigger. Robust flavor – By allowing the grounds to brew for a longer period of time it allows more of the bean flavor to enter the water. This slow process prevents less change from the original flavor substance…the coffee bean! Stays fresh longer – Heated coffee goes through two chemical changes; once when heated and another when cooled. This changes the overall taste of the coffee. Ever tried to re-heat coffee later in the day, after it’s cooled off? Yeah, taste like straight up ashtray! By removing the heating process you’ve reduced the amount of chemical changes that occur, which locks in the original flavor and keeps it around longer. It depends. If you’re using the same coffee-to-water ratio as with your hot brewed, the cold brew will have less caffeine than its hot counterpart. But, if you’re using a higher ratio of coffee to water than you would with your hot brewed – then yes, it will be stronger. Pour coffee over ice, add in the creamer, and enjoy! Make your own cold brewed coffee right at home this summer – then sweeten it with a dairy free homemade vanilla creamer! Pour coffee over ice, add in creamer, and enjoy! If you do not have a coffee bean grinder, regular grounds should work fine.